Nestled between the Carson National Forest and Rio Grande del Norte National Monument, Questa is all about the outdoors. This is the northern gateway to the Enchanted Circle, but the rugged authenticity of Questa stands in contrast to the resort towns nearby. Just a half-hour north of Taos, this village is one in a long string of small, historic settlements that lie scattered up the Rio Grande. The Questa area was first settled in the late 1700’s and officially founded in 1842. It was a rough, remote location that was vulnerable to Ute raids for many generations. A thick-walled adobe church stands at the center of this traditional community and gave the village its original name of San Antonio del Rio Colorado. ‘Questa’ was an Anglo attempt at simplification but became an official misspelling of the Spanish ‘cuesta’, referring to the ‘ridge’ where the old church plaza was built. This historic structure suffered major damage several years ago and is undergoing painstaking reconstruction by descendants of the very worshipers who built it. Visitors are invited to lend a hand every Saturday morning! Questa today is renowned for its beautiful scenery. This is a favorite getaway for residents of Taos, and even Santa Fe, who wish to escape the crowds. 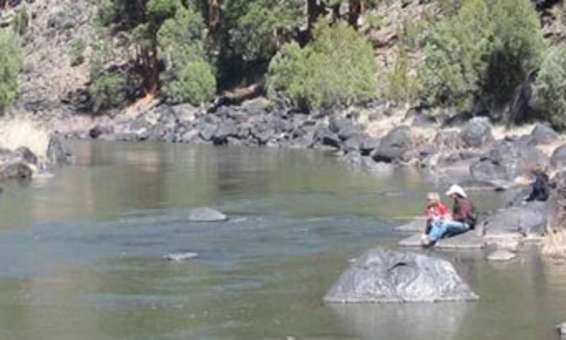 There are trails here down into the Rio Grande Gorge, trout fishing in rivers and mountaintop lakes, and access the highest reaches of the Sangre de Cristo Mountains. This village is still home to farmers and builders, expert hunters and skilled craftspeople. The outlying neighborhoods have attracted artists and writers who enjoy the affordable land and independent lifestyle. Questa’s events combine a love of the outdoors with often surprising sophistication.